If you like to bet on sports, but want to try something different, one option is to play online poker. Online poker is different from any other game in the casino because you control your outcome. There’s no house edge – it’s you versus the other players at the table. That’s why poker is the game of my choice. I like knowing that I just have to be a little bit better than the other players at the table in order to win. You can do it too. And if you don’t know where to start or how to play poker, then this article will help you out. Some of this should be obvious – I hope. You play online poker online (duh! ), from a computer using an internet connection. The upside to this is that you’ll have access to hundreds of cash games, tournaments, SNGs and variations than you’ll ever hope to master. And it’s only a couple clicks away. Here is an idea of how all the technical stuff works. All poker sites use software – either proprietary or leased from a network. What this means is that you’ll either join a site with one off software, like PokerStars or Full Tilt, or join a site that looks the same as others, like Carbon Poker or Bet365. You can play games from a download, your browser or mobile device. You’ll have the best experience playing from the computer download, if anything because of the better graphics, player options and sheer number of games and variations. But I expect mobile and browser poker to catch up in the near future. All cards are dealt at random using a random number generator. This ensures the games are 100% fair (assuming you join a legit poker room) – there are no human errors. Once you have an account and make your deposit, you can choose what games you want to play and register. If you keep or win any money, and the game ends or you leave, the money will go back into your account. Then, if/when you decide to cash out your winnings, you choose a withdrawal option that works, follow the instructions, and you’ll have your money within a few weeks. What Are The Best Poker Sites to Join? It’s hard to give a recommendation for where to play. Everyone has different games and variations they like, deposit methods and software they want to use. And sometimes players from certain countries are prohibited from joining a specific site. PokerStars – Everyone should have an account here. PokerStars has the most players, most games, variations and stakes. Their guaranteed tournaments are the largest, and their VIP program is for all players – recreational or pro. And you can play at their site from all devices and platforms. Now that PokerStars is also legal in India makes them a very hot spot for poker crazed players. Bet365 – I recommend them because we recommend them to the sports bettors that visit our site. You can use the same account to play at the sportsbook, poker room and casino. Besides that you can play from your phone, participate in a $1,000 deposit bonus, and play their jackpot SNGs, a fun variation exclusive to the iPoker Network. What Poker Games Can You Play Online? If you like action games the fast fold poker games are the way to go. The general idea is that you don’t have to wait to fold your hands – you can fold as soon as you receive your cards. Once you do the site will place you at a new table and give you a new hand to play. This variation gives you the opportunity to play a few hundred hands per hour. If you want a good bang for your buck, I recommend checking out guaranteed tournaments. If you use a good strategy you can play for hours, and cashing will always get you at least 2-3x your buy-in back. And if you happen to make a deep run you can win lots of money – sometimes life changing money. Another game with good value are step tournaments. These are like satellites in that you buy in for a small amount to win a seat to a tournament with a larger buy in. The difference is that it’s broken down into a series of tournaments. For example, say you buy into the step 1 tournament for $1. If you win that tournament you’ll win a seat to the step 2 tournament. Say you make it to step 5 – if you lose that tournament sometimes you’ll get a chance to redo it or move back down to step 4. This gives you a ton of relay value for your money, and multiple chances to make it through to the very end. There’s no way I could tell you how to play poker in such a short space. Books have been written on the topic – and they don’t even cover everything you should know. Play fewer hands: The idea here is that if you play only the best hands, often times on the flop you’ll still have the best hand (or can make it). You’ll avoid awkward spots where you’re not sure you have the best hand or exactly where you stand. Position: You want to play in later position whenever possible. It’s relative too – it doesn’t mean you only play hands on the button, but that you want to have position on your opponents whenever you can. This gives you the chance to see the action unfold before you have to act, giving you as much information as possible. Always raise: By raising you give yourself a chance to win preflop. You build a pot when you have a good hand, and you also take the initiative so you can make a continuation bet on the flop to take down the pot. Practice good bankroll management: Make sure you play at stakes at the appropriate level for your current bankroll. This is to avoid losing it all and thus not being able to play for a while. If you have $1000 in your account, you do not play $5/$10 NL Hold'Em, that is a recipe for disaster. Rather drop down to $.5/$1 or lower and try to grind out a bit to keep your funds for longer. 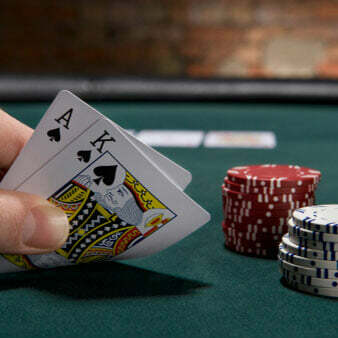 Never deposit and play with money you cannot afford to lose: Even though poker is a skill game, it still has a (big) element of chance attached to it in the short-term, and you should be aware of this. You can keep getting the money in with the best of it and still lose money in the short-term, so never gamble with money you cannot afford to lose! Stop playing if you feel you are going on tilt: If you lose a big pot, get sucked out or just generally are distracted or in a bad mood, stop playing immediately! Your decisions will not be optimal when you are under any form of stress. It is fine to leave the table and come back later. You can also try (paid) training sites like Ivey Poker or Deuces Cracked.